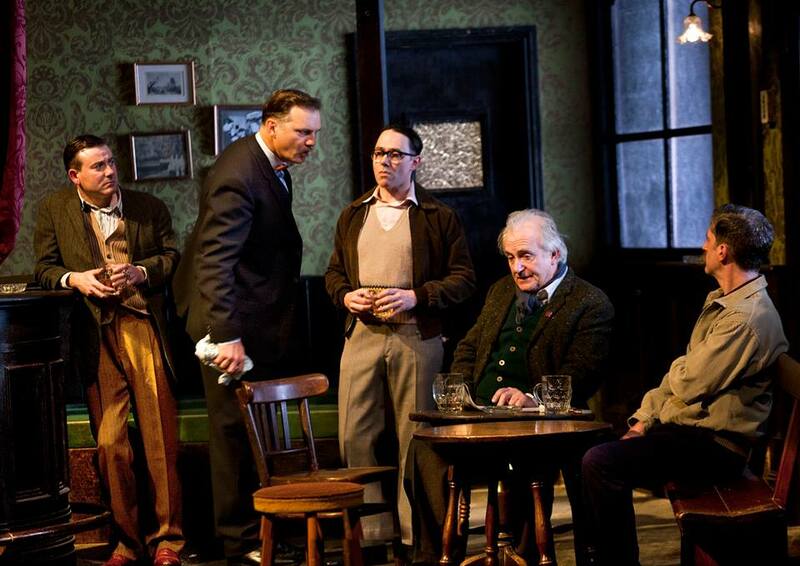 Expectations ran high for Hangmen, Martin McDonagh’s first new play for the London stage after ten years away. In the intervening years he turned his attention to Hollywood and delivered one of the most impressive debuts of recent times with In Bruges – a film that is remarkable for having managed to make it through the torturous process of film financing with its jet black content largely intact and, equally impressively, managing to get a good performance out of Colin Farrell. For Hangmen he moves out of the small Irish villages where he made his name. However even as the landscape changes, the faces remain resolutely familiar. In the depressed Northern landscape of the 1950’s comes a cast of characters every bit as recognisable as those inhabitants of rural Ireland; spending their days congregating in the local pub, and being every bit as feckless as those seen in The Cripple of Inishmaan. Lacking any real clear sense of backbone, they spend their time revolving around the kind of minor celebrity that can hold together a kingly court in a land like this; David Morrisey’s Harry Wade – Britain’s last hangman, and every bit the self-proclaimed equal of that ‘bloody Pierrepoint’. What makes a McDonagh play so enjoyable to watch is that you genuinely have no idea what direction it is going to go. Within the opening quarter there is a spectacular coup d’ theatre that changes the dynamic of the play entirely and throughout the plot jack-knifes at unexpected angles. Many playwrights attempt this kind of shift but few are very successful. It requires building an implicit trust in the audience that the pay-off is worth undercutting the narrative flow. McDonagh has wit and plot devices to burn, and there is a ghoulish horror in suddenly recognising that where he has decided to go with a story is so much further than you would have thought someone would have dared take it. His earlier plays have amply demonstrated that he is a master at finding the absurdities in the grotesque, and if Hangmen never quite reaches the blackest pitch of his early work then it still displays enough of his trademarks to make it an entertaining, if very slightly more West End friendly, production. McDonagh is an actor’s writer. He gives charismatic performers the chance to revel in scintillating dialogue that is in shockingly poor taste but always undercut by a roguish charm that makes even the blackest heart slightly lovable. 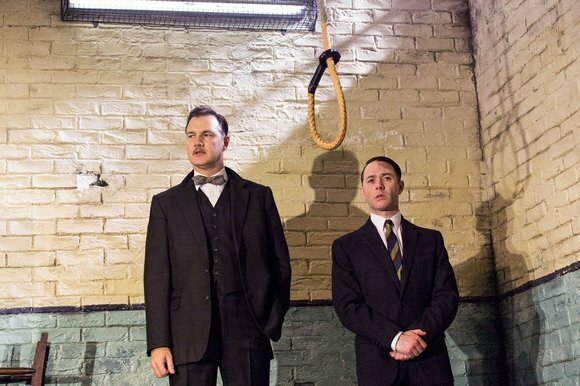 At Hangmen’s core is David Morrissey; a man built for the stage. He effortlessly commands proceedings and dominates the stage with a physicality and intensity that suggests there is the potential for truly great performances. He plays the part to perfection – a man totally in hock to the legend that he has created for himself. It is no doubt with a knowing smile that McDonagh allows Wade just enough rope to hang himself with. The interview he gives to the local newspaper – full of bravado and pomposity – is one of an emperor parading in front of the crowd safe in the knowledge that his court would never dare mention the questionable choice in clothing. He is a man drunk on adulation and with enough intelligence to crush any dissenting voices. Yet like any king who reigns without power, ultimately he is at the whim of his subjects and when he needs them the most he finds they abandon him. Alongside Morrissey, the play can boast some fine performances. Reece Sheersmith has made a career out of playing the kind of unctuous sidekick that he takes on here. It is a meeting of minds – a creator of The League of Gentleman and Inside No. 9 should feel perfectly at home within a McDonagh script, and so it proves. He has an obsequiousness married to desperation that is absolutely right for a frustrated man getting increasingly out his depth. The play also leaves us in no doubt we are living in a man’s world but the two female characters are captured well by McDonagh and very strongly played by Bronywn James and Sally Rogers. They are the smartest people in the room, and each manages to capture a quiet, internalised frustration with the hand that life has dealt them. 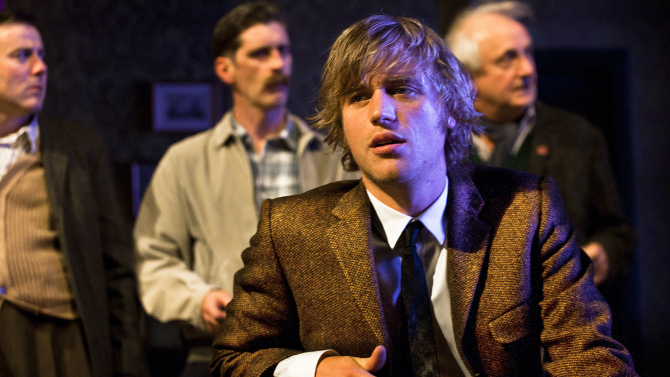 The most impressive support comes from Johnny Flynn – perhaps better known as a musician but who can also boast Jerusalem and a McDonagh play among his acting credits. He has been given a delicious part that – with his estuary twang – positively screams Pinter by way of Pete and Dud. From his very arrival in the north, he is an anomaly and as the play develops McDonagh continues to play with our expectations of what motivates him. Despite all of these positives there is something a little disappointing to the evening. Perhaps it is because this is not the blistering, brilliant McDonagh of his early trilogy. It feels as if he has set out to write a more mature, comprehensive play; it attempts more – a reflection on the end of capital punishment and society’s desire for extracting appropriate justice – and if it succeeds on its own terms, it never quite manages to deliver the same adrenaline shot to the system of his earlier work. Yet these can be written off as minor quibbles from an increasingly jaded reviewer. Hangmen is an enjoyable evening with much to recommend it. Its transfer to the West End is well deserved and, if tickets remain reasonably priced, then this can be recommended far above much of the current theatre blockers on Shaftesbury Avenue.